Little Sorenson walks on a fence on the Irving Sorenson farm, in an example of a farm safety issue. Little Sorenson rides on a tractor by standing on the side with Irving Sorenson driving, showing a farm safety issue. 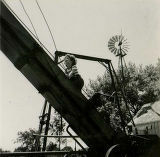 Viewed from below, little Sorenson climbs up the conveyor that carries crops from the wagon to the top of the bins on the family farm, in an example of a farm safety issue. Little Sorenson, on Irving Sorenson family farm, climbs up the conveyor belt that carries crops to the top of the grain bin, in an example of a farm safety issue. A boy pours something from a bucket into a cauldron steaming over a fire. The girls are dressed in coats and bonnets.